Sad news to report tonight. Putting the chickens to bed last night Sam found one on it’s back, legs in the air, under the apple tree. He was pretty sure it was dead until he saw it move slightly. He brought it in to me and I quickly realised it was Arwen. She has been on my watch list since October 2016, when we got settled at home from all the funeral bits we noticed her hunched and not doing much. She was brought in then and given scrambled egg, she perked up after a couple days and went back out with the flock. She never seemed to fully recover though. Each winter I’ve kept an eye out expecting her to not make it to morning or night corn one day but she has persisted. 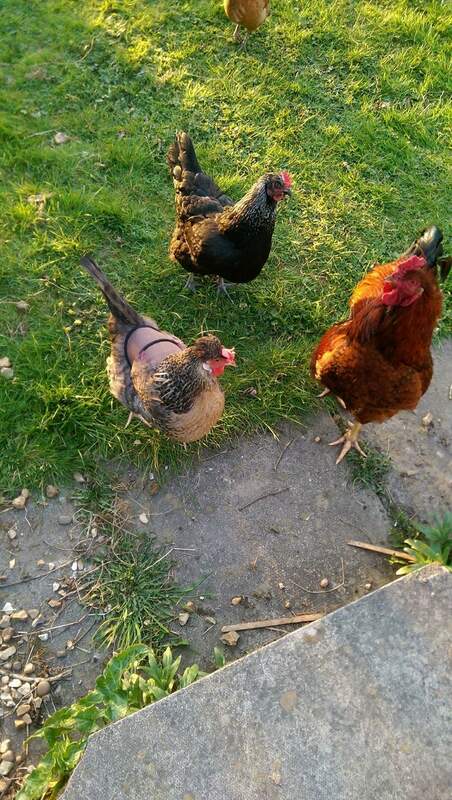 We didn’t put an end to her as she was quite happy running around and eating, wasn’t at the bottom of the pecking order and could quite easily jump over the fence to the garden where the grass was always greener! She was hell to catch too, that chicken was swift on her feet! We brought her in and she was quite cold. I wrapped her in a warm towel and got the hospital dog cage out again. I set her up in our room by the radiator and scrambled some egg. We got some warm water and a pipette too. I gave her a small amount of egg in her mouth which she did swallow and about 1.5ml of warm water. She didn’t resist or move much at all and occasionally twitched which I was hoping was her body trying to get warm. Then I sat with her on my lap until her legs were no longer cold. I checked her over at the same time, noting new feathers she had. She had no lice on her or eggs at the base of her feathers so she had still been preening up until very recently. I left her at that point to settle for the night and see what happened. We moved her to the spare room just before bed as we have to have our bedroom door open for Chi and I didn’t want the cats bothering her. Chi just kept saying the chicken was sleeping, I said that I think she may be passing but I don’t think she really took it in. I was feeling hopeful this morning as Arwen was still with us. 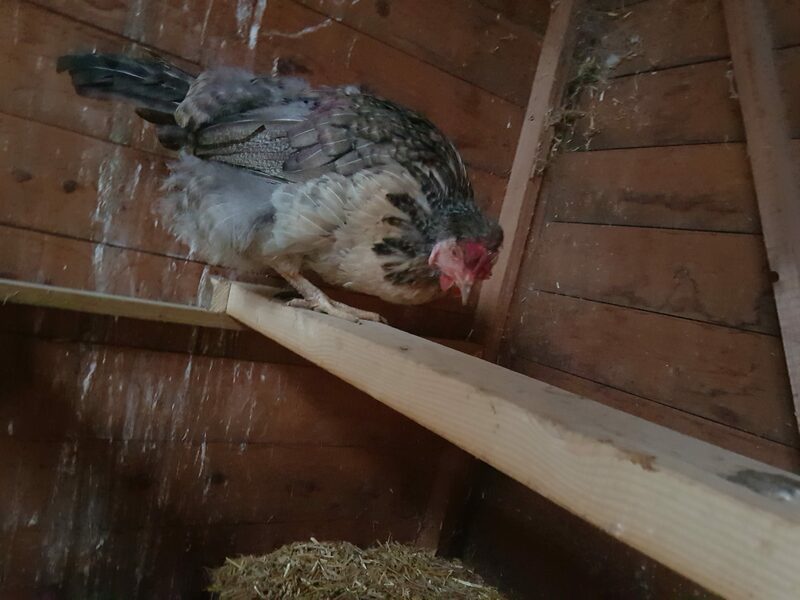 Gave her some sugar water and a bit of cat food (not poultry) to try and boost her as she is also getting some new feathers in (that plus the cold is probably what pushed her too far). She was taking that quite well and I popped in each hour to see to her. She pooped and she was moving about a little, not on her feet but she would spread herself out and move her head. She was also a bit more resistant to me giving her food and water which I took as a hopeful sign and seemed to be opening her eyes more when I came into the room. When Sam brought her in I figured at the very least she would pass in peace, no bother from other chickens or wild animals, and in the warm. At best we could nurse her back to a good quality of life. I wasn’t bothered about eggs from her (I haven’t expected any for a while) but she was once the head of the flock and had been with us from the start, I wanted the smooth path for her, whether that be in a smooth passing or good health. Unfortunately it was the former. I went in to check on her but she had passed. Being who I am I second guess and question things. I saw her the other day when I did the night run a bit late and she had gone in earlier than the others and was hunched. I brought her out and sprinkled some corn which she ate then went back to bed. I made a mental note to bring her in for some TLC soon, maybe if I had done it then she would have made a recovery. We also haven’t wormed the flock in a while, maybe a dose of wormer would have helped her, the worms could have been an extra burden she didn’t need. Whilst we were out yesterday Sam mentioned that a grey hen had been in the nest box last night. I immediately thought Arwen and that we should probably bring her in, but when we got home she had already started the decline. I also stop and think what was it that struck her down in 2016. It could have been Marek’s. She did have pupils of different sizes and she has lost weight, but she just seemed to happy in herself. Plus we can’t treat for Marek’s, just deal with it as it hits us in the flock if we do have it. Maybe it was worms that weren’t cleared by our normal worming. I said before she jumps the fence regularly which can affect how much pellets she eats, instead favouring foraging. Maybe a dose of Ivermectin would have helped. It’s one of the awful things about having animals (be they pets or livestock), they do die at times. We do what we can to give them good lives and good deaths but we will make mistakes. Maybe I made mistakes with Arwen, maybe I didn’t, I’ll never quite know, but I do know that I tried my best for her at all times. It’s a hard line to walk not knowing if you are reaching for medication too quickly/often or not quickly/often enough. Experience over the years will help me refine that balance, I read everything I can but not much replaces experience, I just hate when that experience comes at the possible cost of a life. Rest well Arwen.